Riverdale fans now there is a River Vixens mug for your morning coffee. 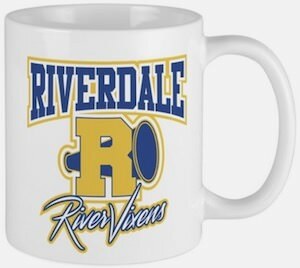 The Riverdale mug is white and on it you will find the blue and yellow River Vixen logo. The mug is available in an 11 and a 20 oz version and both are microwave and dishwasher safe. Now you know how the morning of a cheerleader from Riverdale High starts, with coffee from this amazing logo mug. And if you are not a cheerleader but just a Riverdale fan then you can use this mug too as it is perfect for coffee, tea, and many other beverage at home or maybe even the office.